Luxury brand wants to downsize its ambitions. 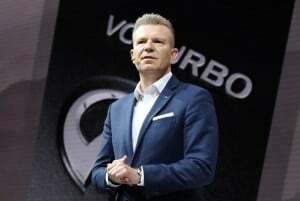 Infiniti's new boss, Christian Meunier, plans to streamline the luxury brand's product portfolio. Nissan’s luxury division Infiniti has a new president. And Christian Meunier has a new strategy for the brand, one that downsizes the marque’s line-up but which he is confident will also make Infiniti more nimble and responsive to changing consumer trends. The automaker offered a hint of where it is going during a news conference at the North American International Auto Show in Detroit on Monday – or at least it tried to. But the QX Inspiration Concept vehicle didn’t want to cooperate, refusing to budge from its hiding spot behind the stage. It was eventually towed out almost two hours after the event ended. Glitches aside, the electric concept vehicle is meant to showcase a variety of trends Infiniti is looking at, including autonomous and electrified technologies, as well as the shift from conventional sedans and coupes to SUVs and CUVs. While the timing for Infiniti’s first self-driving vehicle to reach market is uncertain, it intends to “electrify” all of its models by 2021, whether using pure battery-electric power or as plug-in hybrids. That should help the brand target its two most important markets, Meunier said during an exclusive interview with TheDetroitBureau.com at NAIAS. Chinese regulators recently enacted new zero-emission rules that have generated a huge burst in demand for plug-based products and, by mid-decade, all-electric offerings could generate 70% of Infiniti’s sales there, the new CEO predicted. In the U.S., plug-in hybrids – what Infiniti refers to as “e-Power” models – will likely be the dominant choice, though Meunier said the U.S. could also shift towards all-electric options at a more rapid pace than expected in the coming decade. 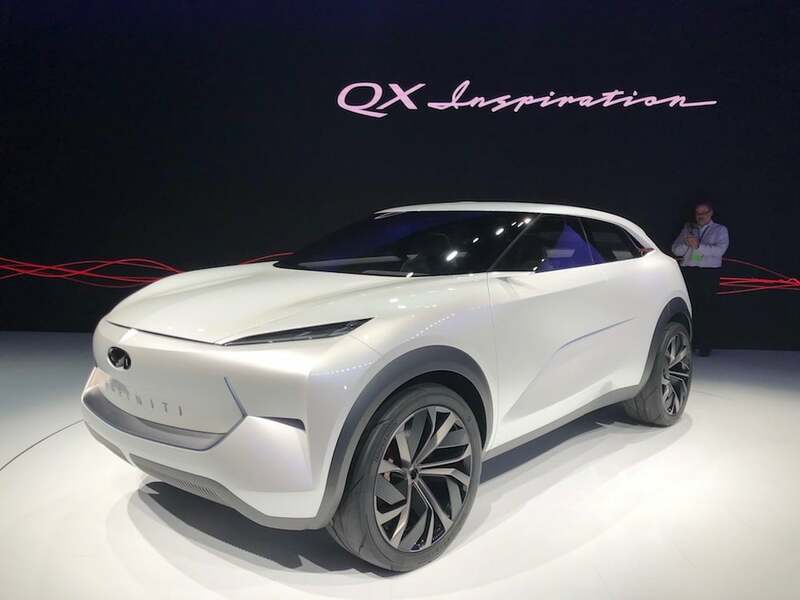 Infiniti revealed the all-electric QX Inspiration concept at the 2019 NAIAS on Jan. 14. Infiniti has already been shifting emphasis away from sedans to SUVs like the new QX50 that Meunier expects will dominate demand in the coming year. Tellingly, the QX Inspiration concept opts for a more ute-like layout than the Q Inspiration that Infiniti brought to Detroit a year ago. While sales of light trucks – a category that includes both SUVs and CUVs – have exploded over the last year, the trend has been underway for more than a decade. To stay on top of such shifts, Meunier said a key goal of his is to turn Infiniti into a “leaner and more nimble” organization. The brand’s product line-up will become leaner, as well. During the last few years, and under outgoing President Roland Krueger, the Nissan luxury arm seemed intent on chasing the German marques that dominate the high-line market. That meant adding an array of new products. But trying to compete, model-for-model, isn’t something that Infiniti has the resources to do, Meunier stressed. Going forward, “Our goal isn’t to have 20 to 30 products, but 10 models that are more relevant to us,” he explained. Sedans and coupes won’t vanish entirely, but there will be more utility vehicles. And, as the QX Inspiration appears to suggest, some of those future products will try to find a sweet spot somewhere between a classic crossover like the QX50 and a sedan. If anything, that means a dramatically different design direction that will take advantage of having the key components of future, electrified vehicles – especially their battery packs and motors – moved beneath the load floor. That will free up space that traditionally would have been devoted to the engine compartment and, in the process, will translate into a larger cabin in a smaller vehicle. “We think this is a unique opportunity to improve the ergonomics of our vehicles,” echoed Karim Habib, the Infiniti brand’s design chief. 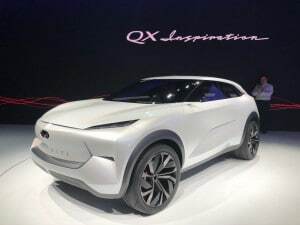 The platform for the QX Inspiration is unique to Infiniti, but a production version will share its underlying architecture with what’s underneath sibling brand Nissan’s own IMs battery-car concept, Meunier said. Going forward, the two brands will work more closely than they have in recent years to achieve “more synergies.” That said, the new president stressed that the goal won’t be to come up with “badge-engineered” vehicles, but to improve economies of scale by sharing the components that buyers won’t care about. This marks the 30th anniversary for Infiniti which debuted at the 1989 Detroit Auto Show. It has long been in the shadows of its Japanese rival Lexus, never mind the big European luxury brands, Audi, BMW and Mercedes-Benz. Meunier is hoping to final come out of the shadows with a quick-to-respond organization and a smaller, more targeted product line-up. This entry was posted on Tuesday, January 15th, 2019 at and is filed under Auto Shows, Automakers, Automobiles, Business, Crossovers/CUVs, Detroit, EVs, Executives, Financials, Hybrids, Infiniti, Luxury Vehicles, Markets, Personalities, SUVs, Sales, Sales, Sedans, Trends, U.S./North America. You can follow any responses to this entry through the RSS 2.0 feed. Both comments and pings are currently closed.